I'm new here and I'm also new to making wallpapers; this my first one. 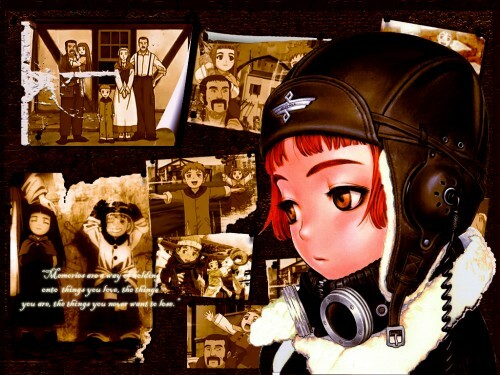 The picture of Ravie from Last Exile is from Range Murata's Form/Code, and the photos are just screen captures from the dvd. The rest is really just the results of my first experiments with texturing/decaying etc, but I'd like to think it tells a bit of a story too. I'd love to here your opinions on it. It seems like a really nice little community here. This is going straight to my desktop.. I love the anime, and this is by far the best wallpaper I have seen to date, of Last Exile. breathtaking work by my favourite artist!